Last May, I posted these fabulous photos highlighting the similarity between Pappa Per and Son Per. If you didn’t take a peek then, I suggest you do so now – they’re uncanny in their resemblance. Truth be told, it’s always been easier to see Per Christian’s paternal gene pool than anything from myself. They’re both blond, they’re both handsome, they both have the same endearing curl of hair at the top of their forehead… At first glance, Per Christian is “papa’s gutt” through and through. But spend enough time with the lad and you’ll start to see a bit of Mommy poke through. The kid has a fierce stubborn streak, equaled only by his equally fierce giggle fits. He’s also a creature of habit, just like Mommy…. first thing every morning after his bottle is his summary inspection of the dishwasher and the shower rack and the book case. Once everything is in (dis)order to his liking, he can then go about his day and see what else is new. I missed this so badly when I was pregnant and unable to sleep sunny side down. 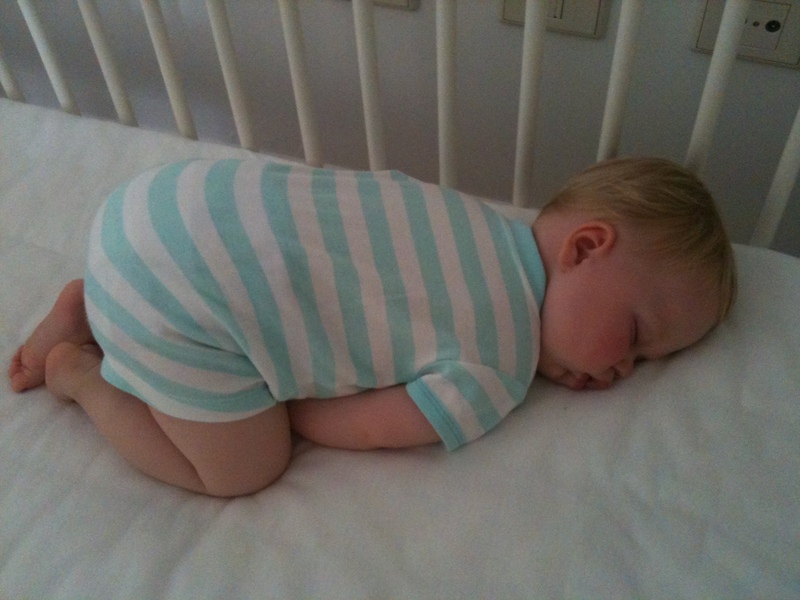 But from the day we stopped swaddling him at three months old, Per Christian has been turning on his belly to sleep. Very rarely do I see him sleeping on his back at night – if he does, then I know he’s truly exhausted and too tired to even flip over. I don’t know any sight as a parent that’s as touching as watching my son sleep.